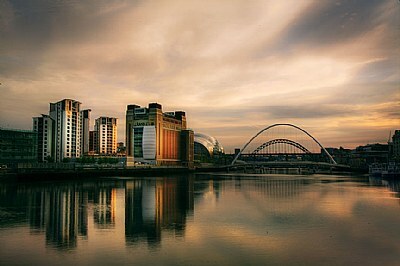 Image Title: The River Tyne. About The River Tyne at Newcastle. Thank you very much Barbara. It is nice of you to say so. That lot don't scare me. I'll take the lot of them on down the Bigg market on a Friday night. I checked and learned that the Trinity Square car park was demolished in 2010. Amazing that they actually got round to it! It had been due to be demolished for ages. Somewhere or other, I have some photos if it with my car parked in an area that was not yet condemned. And of the Sage under construction. Wouldn't it be funny if we ever found out that our paths had actually crossed while taking pictures of the Tyne? This wasn't you, by any chance?? Cheers Paul I didn't realize you mixed with the Rif-Raf, Ade, Steve and Den. I don't think they would have stopped the Geordie Boys.Good to bring back memories for you but The get carter car park is not there now and I'm pleased I got my pics of it before they demolished it.I just love everything about the quayside and the Sage etc and its fun to see the millenium Bridge opening at Mid Day.I do like your image and it is one I don't have. It is nearly 15 years since I was there last. The Sage had only just been started, I think, and the Trinity Square car park was still clinging on to its foundations. They filmed Get Carter there!!! The buildings on the left must be new too. For me, the place used to be all about attempting to get bald fat bouncers in Tescos to accept that I was a legitimate customer, and that just because they had never heard of tahini, it didn't mean it didn't exist. I think I am going to have to sit down. The excitement is getting to be a bit too much. Oh, I am sitting down already. That's kind of you to say so Michele. Thank you Ann. Much appreciated. Thank you so much Clay. That is very kind of you. This should be in the city magazine or travel guide that promotes the city. Excellent composition. Great color and reflection. Perfect in every way. Congrats on your SC award. Congrats on your SC, bravo. Beautiful cityscape. The gentle colors that are reflected in water. All in all - excellent. You transform banal view into interesting photo. I like it.